Radiesse is a volumizing dermal filler that has two distinctive characteristics that set it apart from other dermal fillers; its thickness and longevity. Unlike other dermal fillers, Radiesse does not contain the hyaluronic acid molecule, but rather an inorganic substance containing calcium hydroxylapatite. Radiesse is therefore unique in that it not only fills lines, folds and wrinkles, but it also stimulates the production of collagen, hence producing long lasting results (individual results may vary). Radiesse is used to fill moderate to severe folds and lines, such as the nasolabial folds, marionette lines and frown lines. Radiesse can also be used to enhance facial contours, such as the cheeks, temples and jawline. Due to Radiesse’s unique makeup, it instantly adds volume and provides a soft, natural look that lasts (individual results may vary). 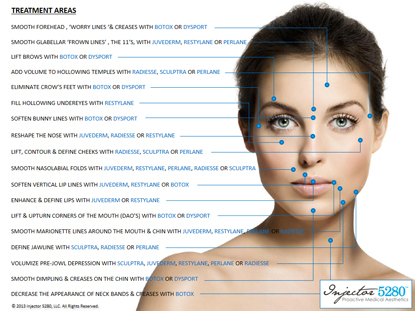 Which Areas can Radiesse be Administered? Softens and corrects moderate to severe folds, lines and depressions, especially the nasolabial folds and marionette lines. What Preparation is needed for Radiesse? The treatment begins with collectively mapping out your customized treatment plan, reviewing post-care and answering all your questions and concerns. Ten minutes prior to treatment, we start with the application of ice and a topical numbing cream which helps alleviate discomfort during the procedure. The injection process takes approximately 30-60 minutes and involves a series of small injections using a very fine needle into the deep dermis of the preferred treatment area. There is very little, if any, downtime or recovery needed. You can resume most activities right away. Unless otherwise advised by your Aesthetic Injector, it is important to not rub or massage the treated areas. Radiesse injections, just like any other injection, can cause some bruising and swelling. We have some special techniques that we use to minimize the swelling and bruising associated with Radiesse injections. However, if bruising and swelling occur it will subside and fade. Some mild redness is normal immediately after the procedure and should diminish in 60 minutes. Make-up can be applied 15 minutes after treatment. If you experience any mild aching at the site of injection after the procedure this can easily be controlled with Tylenol. Immediately after the treatment you will see an increase in volume and a smoother appearance (individual results may vary). It is important to note that even though Radiesse is a longer lasting dermal filler, it needs to be repeated and maintained. The actual length of results can vary from person to person due to differences in facial anatomy, gender, and lifestyle (individual results may vary).